Sizzling barbecues and lazy picnics in the park; summer is here and eating al fresco is at its height. However, it’s easy to leave food out a bit too long or not cook it long enough on the barbecue. Here are the 4 Cs of summer food safety, a few tips on barbecuing and problem-free picnicking from the Food Standards agency. Chilling food properly helps stop harmful bacteria from growing, especially in the warm summer months. ● Keep chilled food out of the fridge for the shortest time possible during preparation. 1. Pre-cook. Consider cooking all chicken and pork in the oven prior to giving it a final ‘finish’ on your barbecue where possible. Your friends and family will still experience that special barbecue ‘chargrilled’ taste – and you will know that you’ve cooked the chicken all the way through. This technique can also be used for sausages, burgers and kebabs if you’re cooking for large numbers. 3. Remember, disposable barbecues take longer to heat up and to cook food. 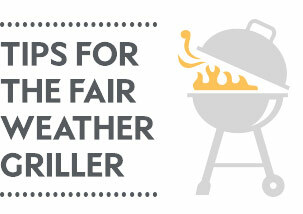 Don’t overload the barbecue and always check that your meat is cooked thoroughly. 4. Avoid cross-contamination by storing raw meat separately before cooking. Use different utensils, plates and chopping boards for raw and cooked food. 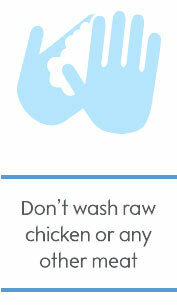 Always wash your hands thoroughly with soap and hot water and dry them before and after handling food. 5. Keep plates and cutlery away from raw meat and fish. And never reuse a marinade used on raw meat, unless you give it a thorough cook first. You’ll only be serving up bugs along with that extra flavour to your guests! 6. Keep cold foods below 5°C and hot foods above 63°C. And don’t leave food that you would store refrigerated standing around in the warm, before serving. 1. 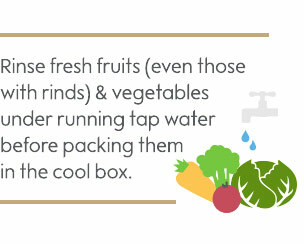 Rinse fresh fruits (including those with rinds) and vegetables under running tap water before packing them in the cool box. 2. Place cold food in a cool box with ice or frozen gel packs. Cold food should be stored at below 5°C to prevent bacterial growth. 3. Pack drinks in one cool box and perishable foods in another. If using freezer packs (frozen drinks work well for this purpose), distribute them throughout the box – not all at the bottom! 4. Once at the picnic site, limit the number of times the cool box is opened as much as you can. This helps to keep the contents cold for longer. 5. Once you’ve served it, dishes should not sit out for longer than two hours, or one hour if it’s very hot outside. After this, the risk of bacteria increases and it becomes unsafe to eat, so best to throw it away when you get home. 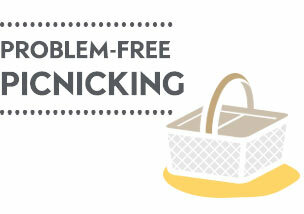 Pack away food so that your guests are not tempted to nibble later. To reduce waste, pre-plan portion sizes according to the size of your party and only pack what you need. The easiest way to protect the family from nasty summer ‘food bugs’ is to store, cook and eat food safely. But, in case you or a loved one gets caught out, it’s a good idea to get to know what to look out for. 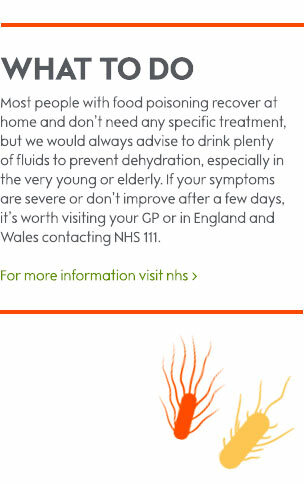 Many people mistakenly think that food poisoning is just a passing tummy bug, but it can be really serious – familiarise yourself with the FSA’s guidance so you’re in the know. Summer food poisoning can be attributed to various bugs including Campylobacter, Salmonella, Listeria and some E. coli. The is the most common cause of food poisoning in the UK. You can’t see, smell or even taste it, but it can lead to people being very ill indeed with abdominal pain, diarrhoea, headache and fever. It can even lead to permanent disability. It is usually found in poultry, meat, dairy products, unpasteurised milk and shellfish and can be spread by cross-contamination, contaminated water or infected animals and their food. This is less common than Campylobacter and Salmonella but it has a high hospitalisation and mortality rate. Individuals with an increased risk of listeriosis include those over 65 years of age, very young children and babies less than one month old. Listeria is particularly dangerous for pregnant women and their unborn babies. Listeria causes flu-like symptoms. This is another common bug found in raw meat, undercooked poultry, eggs and unpasteurised milk. Most commonly spread by inadequate cooking and cross-contamination, it leads to diarrhoea, fever, vomiting and stomach pains and it can make you ill for up to three weeks. This is often passed on through raw and undercooked meats, but can also be spread through other contaminated foods, such as vegetables and salads, water or unpasteurised milk and from person to person. Symptoms can include diarrhoea (about 50% of people infected have bloody diarrhoea), stomach cramps and vomiting and the illness usually lasts between one and five days, although symptoms can persist for up to two weeks. Infection can be more serious in children, particularly those aged 1 to 4 years, when in rarer cases it can lead to haemolytic uraemic syndrome (HUS), a serious condition affectingnthe kidneys.